Honfleur Homards for sale in the Saturday Market. I am a big fan of authentic fishing villages. I cherish the town of Cutler where I was born and raised and have enjoyed visiting many other lobster fishing villages along the Maine coast through the years. There is something very special – almost sacred – I feel in communities with such an intimate connection to a wild food source. While living in the U.K. I have explored a variety of European fishing villages which have wonderful similarities to Maine’s fishing villages. A recent trip to the village of Honfleur made me reflect on the common threads that link coastal communities on opposite sides of the Atlantic. Similar to the lobster fishing villages of Maine, fishermen in the French fishing village of Honfleur unload their catch daily at docks lining the harbor. The catch in Norman ports like Honfleur however is much more varied, with everything from sole, turbot and mackerel to oysters, scallops, shrimp and lobster harvested from a single fishing boat. Some of this harvest is then sold directly to consumers at the dock. In Honfleur, a historic law dating back to the 1600s dictates that if the catch is sold by the fisherman’s wife and within view of the boat, the fisherman does not have to pay tax on the sale. This legislation has helped support and sustain local, small-scale seafood markets and a culture where the village community regularly purchases and consumes fresh seafood directly from their local fishermen. In Honfleur, booths and metal tables are set up on the docks to display the daily catch and residents of the town line up with their baskets to buy that evening’s dinner from fishermen’s wives. It is a excellent ocean-to-table model and made me wonder if Maine could be doing more to encourage small-scale seafood markets throughout the state. 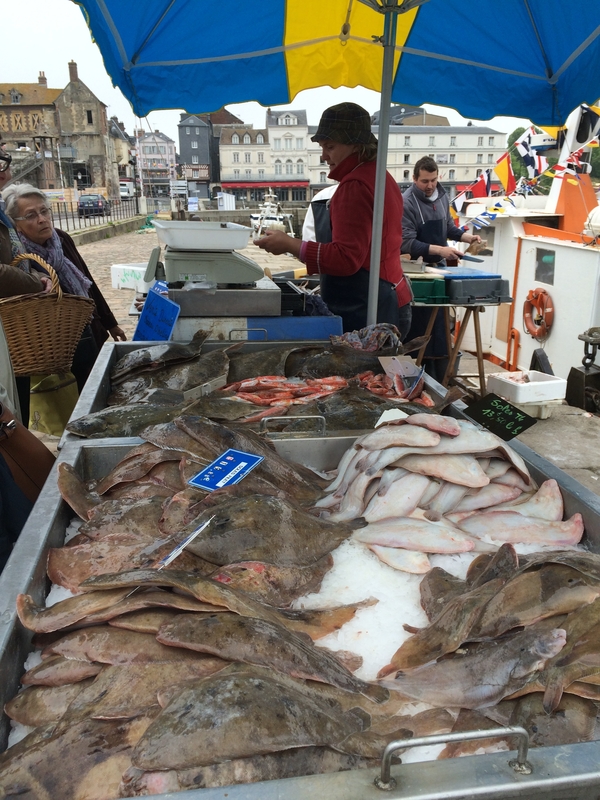 In Honfleur, fresh seafood is also sold at the town market every Saturday. Fish, oysters, shrimp, crab and lobster were piled high on stalls when I visited with my family this spring. 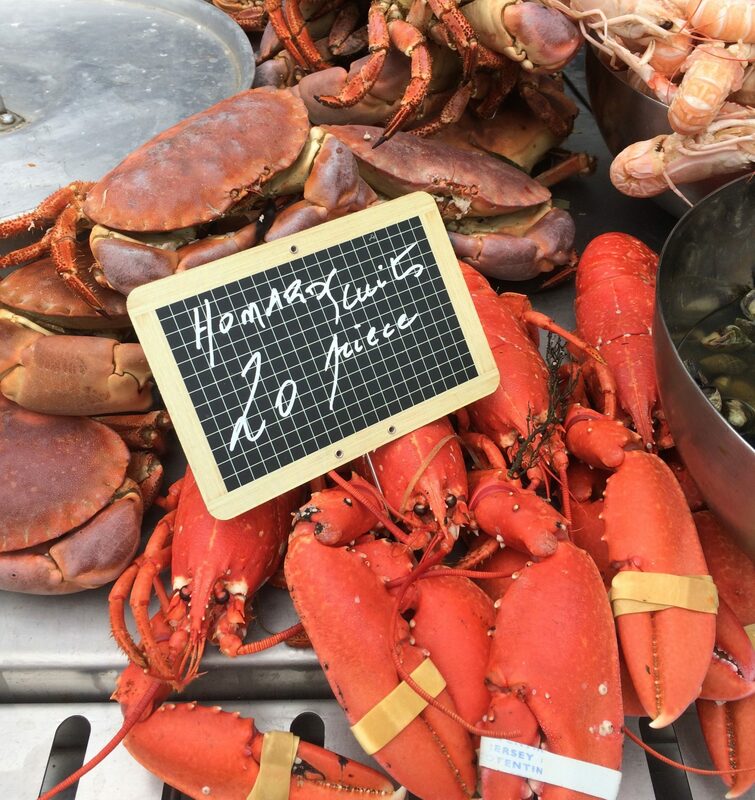 Unlike Maine, Honfleur’s fresh lobster is sold at eye-watering prices . Live lobster was listed at 28 Euros per kilo (that’s roughly $31 for a two-pound lobster). Within two hours, all the fresh lobster at the market had been sold. Several stalls at the market were also making a traditional seafood stew called Marmite Dieppoise which, like Bouillabaisse, is traditionally prepared with leftovers from the catch. A fisherman’s wife selling the daily catch as part of a time-honored tradition in Honfleur. I always enjoy observing how seafood, especially lobster, is served in different coastal villages around the world. Tourists come to Maine towns to roll up their sleeves and feast on shore dinners, clam bakes and lobster rolls. I especially love clam bakes for their rich history and the way they celebrate foods which are native to Maine’s sea and soil. In northern France, restaurants often serve lobster as part of a plateau de fruits de mer – a seafood dish of raw and cooked shellfish presented in a bed of ice on a tiered platter. This cornucopia of seafood contains crab, shrimp, oysters, winkles, whelks, crab, and a lobster which is grilled and served split in two as the main attraction at the top tier of the platter. As with a New England Clam bake (or version thereof), a Plateau de fruits de mer serves as a metaphor for a region’s bounty. And as with a clambake or shore dinner, the diners are expected to roll up their sleeves and get their hands dirty as they eat. Maine fishing villages are fantastic at hosting festive events in the summer. Our Fourth of July celebrations and lobster festivals often make visitors feel like they’ve stepped straight into a Normal Rockwell painting. While in Honfleur I was able to witness the Fetes des Marins, which is celebrated over Pentecost weekend every year. The Fetes des Marins, like festivals in Maine, includes a Blessing of the Sea on Sunday much like the Blessing of the Fleet which is sometimes part of Cutler’s Fourth of July celebration. A local parade, a focal point of our Independence Day festivities, also is a key feature in the Fetes des Marins as well. In Honfleur the parade is more like a procession, made up of sailors and their families carrying decorated model ships. These families wind their way in pilgrimage through the town center to the chapel of Notre-Dame de Grâce where a special Mass is celebrated. Similar to the way Maine people decorate their homes and lobster boats with flags and patriotic buntings for the Fourth of July, Honfleur was decorated with flags. The boats and houses were strewn with garlands of flowers. Beyond a bounty of fresh seafood and charming festivals, Maine and Honfleur share some history as well. In the 17th century Honfleur was used as a launch point for sailors heading to the New World. A group of these sailors helped settle Mount Desert Island. It’s touching to realize how close fishing villages on opposite sides of the Atlantic Ocean can be. 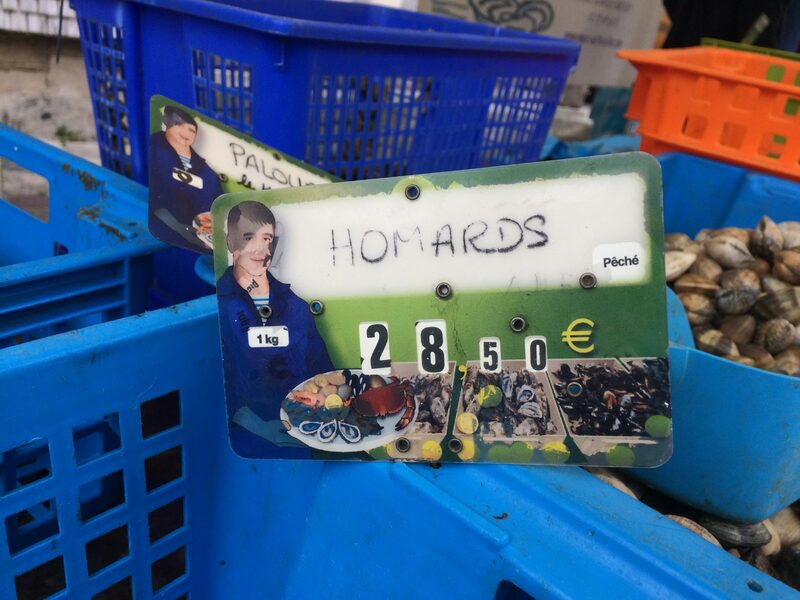 An empty basket of Honfleur Homards, aka lobsters, which sold for €28 per kilo.